JetBlue today [Dec 21] announced it is increasing service to Bermuda with two year-round daily flights and a third summer seasonal roundtrip flight between the island and the airline’s northeast focus cities. In addition to the added flights, the airline will now operate all Bermuda routes using its 150-seat Airbus A320 aircraft in place of its 100-seat Embraer 190 aircraft. “This is a big win for our loyal JetBlue customers on all sides of these routes whether in New York, Boston or Bermuda,” said Robin Hayes, president and chief executive officer, JetBlue. “With more flights, larger aircraft and a variety of flight times to accommodate customers’ needs, JetBlue – with its affordable fares and award winning service – is positioning itself as the top choice for travel to and from Bermuda. “This announcement today will provide further opportunities for our East Coast guests to visit our shores and help meet the increasing demand for airplane seats,” said Minister of Tourism, Transport and Municipalities Michael Fahy. “The Bermuda Tourism Authority is proud to be a marketing partner with JetBlue, creating incremental business for our island and for the airline,” said Bermuda Tourism Authority CEO Bill Hanbury. “We have grown vacation air arrivals out of New York by 44% this year – and we have also been successful at attracting a younger, more adventurous traveler to Bermuda. “Savvy cooperative marketing has been an important component to success, and we look forward to continuing that partnership. Additional capacity out of JFK puts us in an even stronger position for further growth in 2017. The company said, “Starting May 18, 2017, JetBlue will operate daily year-round flights between New York’s John F. Kennedy International Airport [JFK] and Bermuda’s L.F. Wade International Airport [BDA] with an evening departure from New York and a morning departure from Bermuda. “Additionally, the airline will operate a second daily roundtrip during the summer peak with a morning departure from New York and an afternoon departure from Bermuda. 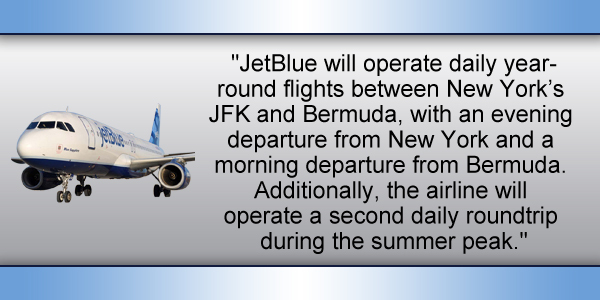 “Together, the enhanced New York flight schedule and additional service will expand JetBlue’s current once daily year-round service and offer more travel options for customers on both sides of the route. “This ensures a well-timed schedule for the Bermuda-based customers every day of the year. Flights between New York and Bermuda are on sale starting today with introductory fares starting at $49 one way. “Also starting May 18, 2017, JetBlue will increase its current seasonal summer service between Boston Logan International Airport [BOS] and Bermuda to year-round daily service. “Flights, with a morning departure from Boston and an afternoon departure from Bermuda, are also on sale starting today with introductory fares starting at $79 one way . “The new and expanded flights will allow for even more nonstop service throughout the year between JetBlue’s northeast focus cities and Bermuda. The flights will also benefit connecting customers in Bermuda and across the JetBlue network. JetBlue has been an excellent marketing partner – imaginative and innovative – a true believer in the Bermuda tourism product. With our teams working collaboratively we have enjoyed success over the past year, creating incremental business for Bermuda and for the airline. The industry-wide numbers tell the story. This year vacation air arrivals out of New York are up 44 percent, made possible by a 40 percent increase in the number of passenger seats flying to Bermuda. Today’s news paves the runway for further growth in 2017, not only for travellers from New York, but for those in Connecticut and New Jersey as well because they have easy access to JFK. Out of Boston’s Logan Airport seat capacity is up 3 percent and visitation from Massachusetts is up 6 percent. Modest growth. Now, with JetBlue set to serve Bermuda from Logan year-round – and with a larger aircraft – we are properly positioned for growth out of Boston, growth that is likely to be better than modest. Our team will work in lockstep with JetBlue to market to consumers all over New England – Massachusetts, Rhode Island and New Hampshire. Increased inventory on a year-round basis will help us to break the back of seasonality. It means a year from now, next winter, we’ll have an even better chance to keep hotel workers on the job, taxi drivers on the road and attractions across the island open to welcome visitors in the shoulder season…. When you’re an island out here in the North Atlantic, air travel is the pilot light to economic activity. Without it opportunities dim, with it opportunities are brighter. Today’s news is good for every facet of our economy. Lastly, but not least importantly, marketing partnerships where the destination and the airline work as a team to attract travellers is a fiscally prudent way to bring new inventory online and to increase air arrivals. Both sides have skin in the game and both sides reap the rewards of success. Marketing partnerships of this kind are cost effective and they relieve Bermuda’s taxpayers from the risk of paying for airline seats that don’t get filled. Our job now is to further build on an already strong marketing relationship with JetBlue. We want travellers in the New York tri-state area and in New England to know they have significantly more options for travel to Bermuda in 2017 and beyond… and quite frankly, with the fares just announced by JetBlue, there’s never been a better time to visit. Today I have more good news for the people of Bermuda, following last week’s announcement regarding the ITU world series. Starting in May [May 18], for the first time ever, JetBlue will begin a year-round service between Boston and Bermuda – a flight which has been seasonal [May to October] for just under 10 years. As a further perk, JetBlue will be using their 150-seat ‘Airbus 320′ aircraft for this route, replacing the ‘Embraer 190′ which has only 100 seats. This will allow us more seat capacity year round. So where we had 100 seats a day for six months, now we will have 150 seats a day for 12 months. When the Boston service was secured almost ten years ago, the objective was to eventually get a year-round daily service…and now that day has come. Over the past few years, following the success and popularity of the Boston-Bermuda flight, JetBlue has made incremental additions to their flight schedule for this route…starting the season a week earlier and pushing back the end of the season by a week or two each year. This announcement today represents their belief in Bermuda; their commitment to Bermuda. The Ministry of Tourism, Transport and Municipalities has, as one of their tourism objectives, a desire to lengthen the tourism season. Having a year round presence out of Boston is another step towards being able to realise that objective. JetBlue has offered one daily flight between Bermuda and New York’s JFK Airport during the summer using its Airbus 320 and had been, during the winter months, operating one flight using its 100-seat Embraer 190. Now – JetBlue has replaced the 100-seat aircraft with the 150-seat Airbus 320 year round out of JFK. And in addition, it will, for the first time in several years, introduce a second summer flight that will arrive in and depart from Bermuda in the early afternoon. The one flight that will operate year round will depart JFK in the early evening arriving in Bermuda at 9:55pm. The return flight will depart Bermuda at 8:30am arriving in JFK at 9:53am. This new schedule will open up many more destinations for both residents and visitors to connect to and from. The increased JFK and Boston services will provide even more options for our East Coast visitors to frequent our shores and help meet increasing demand for airplane seats…Year-to-date, vacation air visitors from the United States were up 20 percent compared with 2015. This announcement today has been made possible through the efforts of a joint working group consisting of persons from the BTA and the Ministry of Tourism, Transport and Municipalities. The arrangements were finalized last month following a meeting between myself, General Manager of Airport Operations Aaron Adderley and JetBlue in New York City. 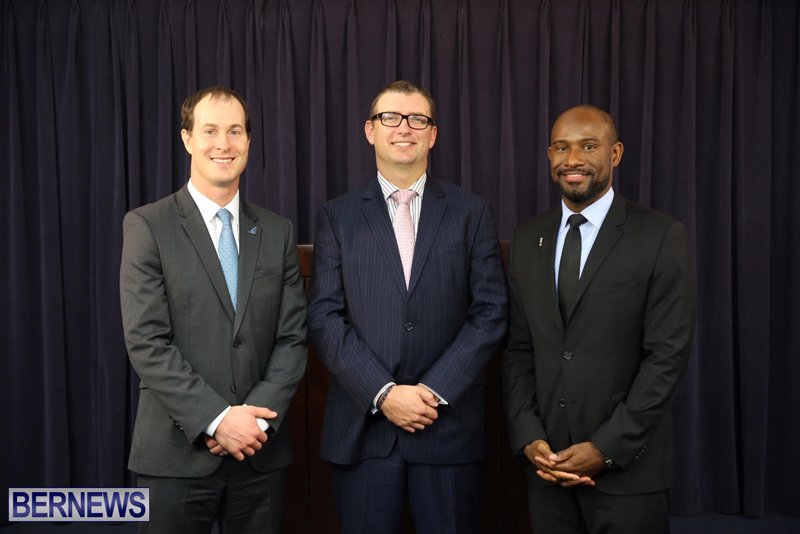 The Ministry and the BTA have been working together closely to approach airlines collectively, in a joint effort, with the common goal of expanding Bermuda’s airlift; that relationship is bearing fruit as indicated by this announcement. I should also mention that JetBlue will offer an introductory fare of $49 from JFK and $79 from Boston. This has been a very positive year for tourism in Bermuda and I am thrilled for 2016 to conclude on such an encouraging note. Slow down OBA. There might end up being more strikes.. So P.L.P. NEVER had an increase of flights. Yes they did. There was the one from Germany. That didn’t last long. Then there was the flight from Chicago. That did not last long either. Seem to recall a couple other flash in the pan flights that did not last long. So, bottom line, no the PLP did not increase flights. Hey, but they went out & threw a couple of baseballs before the game when nobody pays attention. They had some buses in London painted pink. Maybe it was taxis. Who remembers? Then there were pink mopeds somewhere else. Again, did anyone pay attention? Didn’t they go China somewhere also. Amazing how when people tell 1/4 stories that those dumb enough to beleive them will… PLP First Initiated Jet Blue Flying to Bermuda, let’s start there..American Airlines Miami Flight – yes PLP’s doings, West Jet out of Toronto a PLP Gov’t initiative also, Zoom Airlines out of London (Company went Bust) PLP Gov’t Initiative also.. I’d be impressed when I see your UBP Gov’t (Yes UBP) pull a Lufthansa out of Germany Direct, or KLM out of Amsterdam, until then I won’t jump up and down screeming success for another JFK Flight…. OBA suggesting tourists would have to get a local license to rent a 15hp mini-car seemed to cause Massachusetts to declare our license to be invalid to rent out there. The real question is what did the OBA pay them, what deal was struck? Stop being stupid people BOB the destroyer said we had no money. Yo! @ $$$s, read the print. Then. Read some more. You might just learn something. Idk, BTA and Ministry revamped marketing strategies have been paying off. JetBlue’s JFK flight flies in and out pretty heavy every day it flies. I would even go as far as saying the flight has been heavier during the winter than it was during the summer. You definitely don’t know what you’re talking about. Jet blue flights are never full compared to American Airlines. Although this may help lower ticket prices when it comes down to competition. Thank you, JetBlue, BTA and the Ministry! More flights are good for all of us— tourism, residents and international business. This is great news indeed, and surely a lot of work went into securing these flights. This is why the OBA has to go! More flights mean more foreigners! Nice. But come on, another flight to JFK. This now makes 5 flights during the winter and 6 flights during the summer including United to Newark. The customers will love this but I can see an airline making moves. Hey Einstein, an early flight to JFK means a lot more options for connecting flights elsewhere. Use your head for more than a hat rack once in a while. Can we get a different airline to compete with Delta out of Atlanta. Now if O B.A. pulls that off, they’ll get my vote. Have you noticed who rules the roost in Atlanta? What we need is a Southwest out of BWI. Huge airline & BWI is a big hub for them. You forget that the Airport got Southwest/AirTran to fly out of BOTH Atlanta AND BWI a few years ago, but the Atlanta flight was gone by the end of the summer and the BWI flight gone the following year – no demand! Flights were empty. Sigh. We love Bermuda but there needs to be flights direct, non-stop, from southwest Florida. We have been waiting for years and would love to return to the island we love so much. Thank you, in advance. Well done to all concerned. Now can we please have a direct flight – Delta or Jet Blue – to and from Orlando/Bda at sociable hours. Awesome news, but can we get Southwest Airlines to fly to Bermuda out of destinations like Atlanta, Orlando and BWI…also a competitor for British Airways! Atlanta & Orlando are not major Southwest hubs. BWI is the biggest eastern hub with direct connections to many cities. How about working a deal to get some Bermudian pilots working with B6. Provided they pass all the training it could be a win-win for both Bermuda and B6. Relationship building! I’m certain qualified experienced Bermudians could apply to work for JetBlue. I personally only know one young Bermudian that fits the bill and he’s currently based in Florida flying for a executive jet company. How about direct flights to Boston year round on Jet Blue? is it that dificult? And time to get BA finally competition for Europe! its been a topic for years!!! sorry I just saw the Boston service updated, nevermind! When will we get Night Flights why does every flight to or from this island have to be during the day??? Maybe that’s because Bermuda being the great ‘Nation’ and ‘Country’ that it is is really just too tiny to find at night . We definitely need a night flight departing for JFK/MIA/ATL. The problem is logistics and scheduling. If I remember correctly, there were talks of a flight arriving in the early afternoon and departing in the evening, not sure which airline that was. I believe it was JetBlue or maybe United. The announcement today by JetBlue may have been the ultimate decision of those talks tho. Request for the airlines….any chance we can get an after work flight from BDA to NYC. Departing BDA around 6, 7 or 8pm? Bermudians are crying out to fly after work and this way the tourists can spend the entire day on the beach before flying out. Now all we need is a new airport to land at. Oh never mind on its way..
JetBlue out of ATL and or Ft. Lauderdale / Miami would be great….. Delta and AA have been poking out our eyes from those markets for years, they need some competition. Expanding our flight inventory – great news! Thank you.